A couple of weeks ago I saw the movie 'Pirates! Band of Misfits'. I really enjoyed it and I definitely think kids will enjoy this film. The great adventure starts with a pirate who tries to compete against his two biggest enemies for the 'Pirate of the Year' award. The Pirate Captain (Hugh Grant) is not taken seriously, but this might change if he could only win the Pirate of the Year competition. As the event is soon to start, the Pirate Captain makes it his goal to leave his enemies, Black Bellamy (Jeremy Piven) and Cutlass Liz (Salma Hayek) behind. 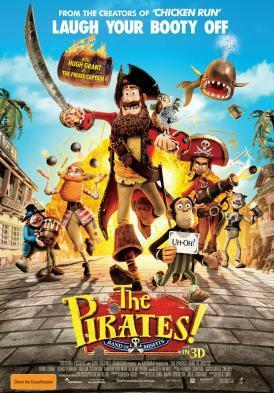 Before anything can happen, the determined Pirate Captain will have to find the help of, Charles Darwin (David Tennant) (who might just turn out to be evil) and fight a crazy Queen Victoria (Imelda Staunton), who is trying to kill him. This movie is hilarious, a bit scary and action-packed. I give 'Pirates! Band of Misfits' a rating of: 4.9/5! Why? The kids will enjoy this film.